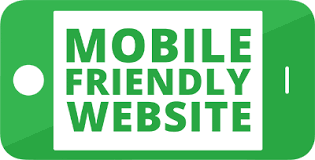 Press CTRL + D to Bookmark this Site & F5 for Refresh ! 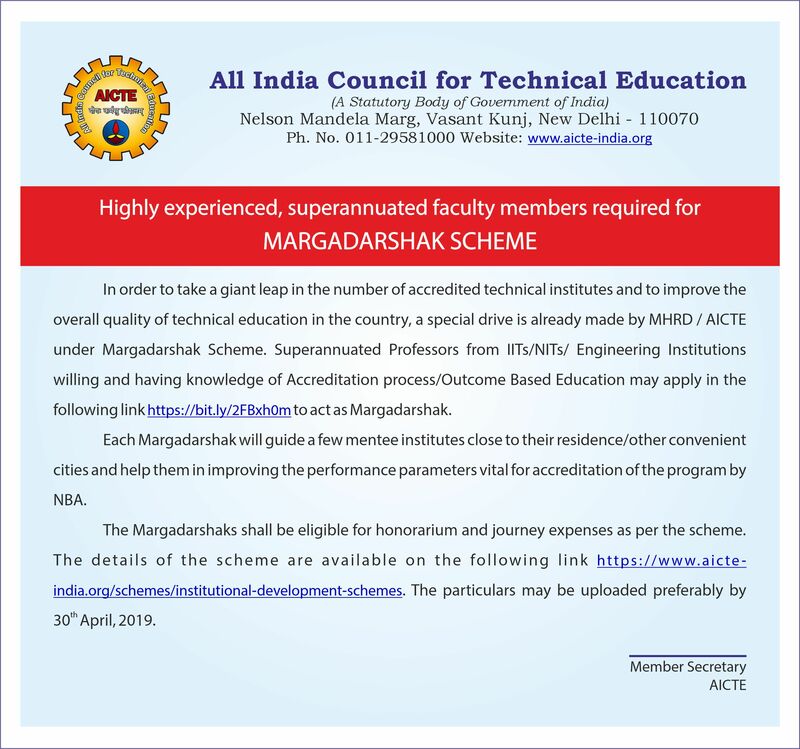 In order to take agiant leap in the number of accredited technical institutes and to improve the overall quality of technical education in the country,a special drive is already made by MHRD I AICTE under Margadarshak Scheme. 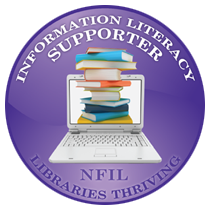 Superannuated Professors from llTs/NITs/Engineering Institutions willing and having knowledge of Accreditation process / Outcome Based Education may apply in the following link to act as Margadarshak. Each Margadarshak will guide a few mentee institutes close to their residence/other convenient cities and help them in improving the performance parameters vital for accreditation of the program by NBA. The Margadarshaks shall be eligible for honorarium and journey exNBpenses as per the scheme. The details of the scheme are available on the following link The particulars may be uploaded preferably by 301 April, 2019. CHENNAI: After successive scams rocked the examination and evaluation of mark sheets in Anna University , the premier engineering institution of the state is planning to introduce online evaluation of answer scripts. 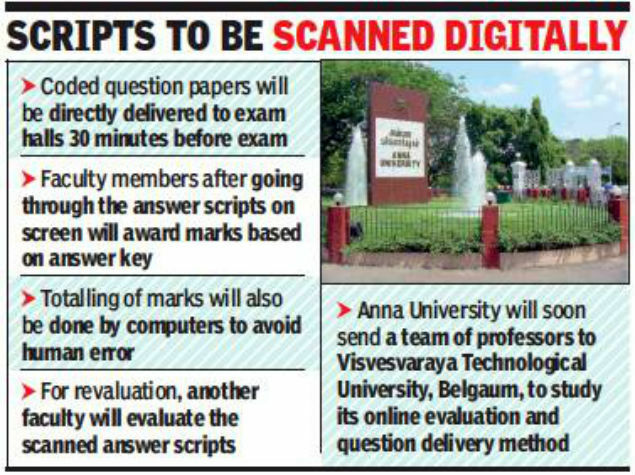 The university will soon send a team of professors to Visvesvaraya Technological University (VTU) in Belgaum to study its online evaluation and question delivery method. 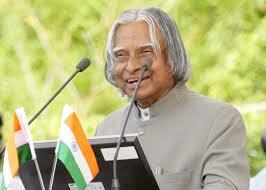 “The technology-based examination system needs to be done in different stages. In the first step, the delivery of question papers will be made online without physically transporting them to the exam centres. It would prevent question paper leaks,” said M K Surappa, vice-chancellor of Anna University. As per the existing process in VTU, coded question papers are made available just 30 minutes before the commencement of examinations at exam centres. The invigilators must take printouts and issue the question papers to the students. After the examination, the answer scripts would be scanned for online evaluation. “The faculty members can go through the answer sheets on screen. When the answers are matched with the answer keys, they can award marks. Marks would be automatically added by the computer reducing errors in totalling marks,” the VC said. Very often, students apply for revaluation for errors in totalling marks. It would make the revaluation process also easier. 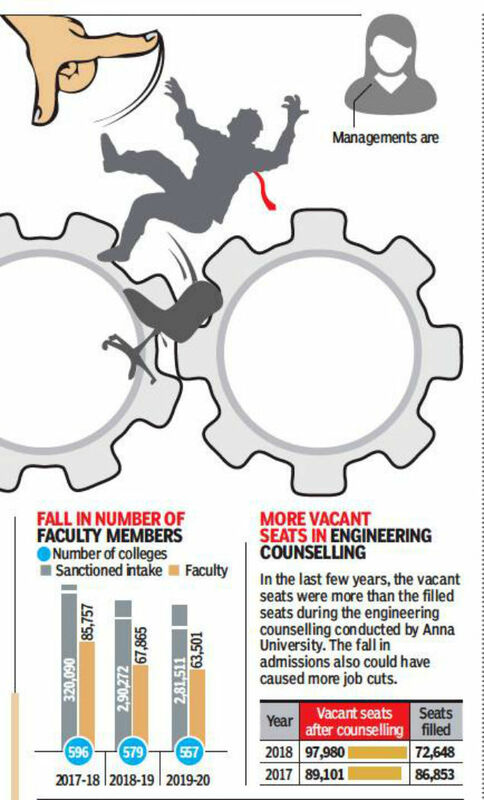 CHENNAI: Relaxation of the student-teacher ratio by All India Council for Technical Education (AICTE ) and falling admissions in engineering courses have forced 22,256 engineering faculty members out of their jobs in 2018 causing concern among educationists that it may further bring down the quality of engineering education in Tamil Nadu . With admissions declining, unemployed engineering teachers with PG degrees are finding it difficult to get new jobs. Some are forced to work for meagre salaries. Data submitted for affiliation with Anna University for the academic year 2019-20 show that 557 engineering colleges in Tamil Nadu have 63,501 faculty members for the sanctioned strength of 2,81,511 seats. During 2017-18, 596 colleges had 85,757 teachers for a sanctioned student strength of 3,20,090. In December 2017, the AICTE relaxed the student-teacher ratio for colleges from 1:15 to 1:20 from the 2018-19 academic year. Tier-2 and tier-3 engineering colleges that were in financial crisis due to fall in admissions immediately sacked a large number of faculty members. The existing teaching faculty were overburdened, which limited the scope for research. 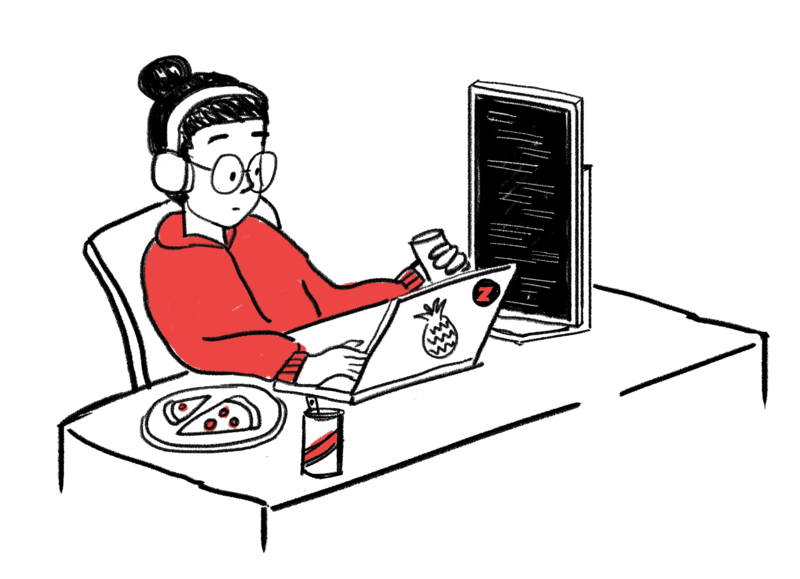 “As soon as the announcement of relaxation came, the college forced us out. Of the 80 faculty members, the college sacked 45 for demanding salaries,” a faculty member who lost his job last year told TOI. Instead of sending the poor performers out, colleges laid off senior staff with higher pay to cut costs. “During annual inspection, they hire faculty members temporarily and show them as professors,” another faculty member said. 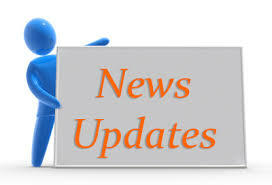 AICTE has prescribed a minimum salary for engineering faculty. But colleges, citing a large number of unemployed teachers, pay only `10,000 to `20,000 a month to new recruits. Zomato has opened up registrations for its ‘Trial Week,’ which is a concept where selected engineers could work with the company’s engineering team for a week. Additionally, those who are selected for the program could also secure a place in the company’s engineering team. Zomato is calling all engineers in India for a ‘Trial week’ at the organization. Introduced in 2015, Trial Week is a concept where engineers from all over the country register to work with Zomato for a week and eventually secure a place in the engineering team. It presents a unique skill-building opportunity for the participants and works as a platform for Zomato to test, engage and onboard some of the most talented engineers in India. Trial Week will also help candidates get familiar with Zomato’s culture and work ideologies. As the first step, Zomato will shortlist the registered candidates on the basis of their profiles- the platform is especially encouraging women to register. The selected candidates will be divided into three groups and called out in April (8-12th, 15-19th and 22-26th) to work at Zomato’s Headquarter in Gurugram, Haryana. They will be assigned some of the most challenging projects which will test their practical knowledge and proficiency. Candidates will also have mentors from Zomato’s engineering team to guide them. The participants who are able to prove their mettle and impress Zomato’s engineering team during the week will be offered a role to work full time with Zomato. Speaking on this initiative, Gunjan Patidar, Chief Technocrat at Zomato said, “We are always on the lookout for talented candidates to further strengthen our engineering team and help us enhance Zomato’s tech stack. Historically, Trial Week has been the best way for us to hire great engineers. A traditional interview gives both sides too short a time to come to a decision. This method, on the other hand, allows the candidate to experience the work environment, people and challenges and also gives us an opportunity to get an all-round perspective of a candidate’s strengths. We opened registrations on 2nd April 2019 and have already received over 900 applications. We look forward to hosting the candidates, understanding their minds, sharing knowledge of what we have been building over the last 10 years, and together build products for millions of users.” Some of the former Trial Week participants, who are now full-time employees at Zomato shared their personal experiences. Walmart-owned Flipkart is the most preferred workplace in India, followed by Amazon and OYO in the second and third places, respectively, according to LinkedIn’s latest ranking released on Tuesday. E-commerce companies, ride-hailing and food-delivery firms, and IT businesses dominated the top spots in the list. From homegrown companies to global giants, the leading firms in the LinkedIn list were cited as those that promised growth, offered jobs and fairness in working conditions and wages. Internet businesses Amazon, Paytm, OYO and Alphabet featured in the top 10 for the third consecutive year. TCS made its debut at the seventh place. New entrants and homegrown internet and consumer services companies Swiggy and Zomato were ranked sixth and eighth, respectively. Uber, another new entrant, took the fifth spot, while, One97 Communications was at the fourth rank and Oil and Energy conglomerate Reliance Industries was at the 10th place. “This year, half the companies are new entrants on the list, including IT giants such as TCS and IBM that showcase the changing job and hiring landscape,” said LinkedIn India Managing Editor Adith Charlie. Only 3.84% of engineers are employable in software-related jobs at start-ups. Around 3% engineers possess new-age skills in areas such as AI, Machine Learning, Data engineering and Mobile technologies. On an aggregate level, employability in these areas is around 1.5-1.7%. US has a much higher proportion of engineers, almost four times, who have good programming skills as compared to India. A much higher percentage of Indian engineers (37.7%) cannot write an error-free code, as compared to China (10.35%). Only 40% of engineering graduates end up doing an internship and 36% do any projects beyond coursework. 62% engineers want to work in a large company Highlights According to a latest study, majority of engineers opt for a job with a large company while a small but appreciable set of engineers opt to join a start-up Elections 2019 The Aspiring Minds’ National Employability Report (NER) 2019 on engineers revealed some interesting data about the increasing skill gap and career aspirations of India’s engineers. The report’s findings are based on data collected from 1,70,000 students from across 750 plus colleges in India. Preference of jobs According to the report, the aspiration of engineers to work for a large company has decreased by 15 per cent. While 62 per cent (men and women) wanted to work for a big/large company, only 8 per cent were interested in joining a start-up (newly established company with less than 30 employees). The United Arab Emirates (UAE) government is going to issue equivalency to all Indian Degrees which match the equivalency criteria. This move comes as a huge relief to those having difficulty in getting jobs in the country. The Indian Ambassador to UAE, Navdeep Singh Suri called on the UAE Education Minister Hussain Bin Ibrahim last week to discuss problems faced by Indian Nationals following the rejection of equivalency of some of the Indian Degrees due to lack of clarity over internal/external marks. 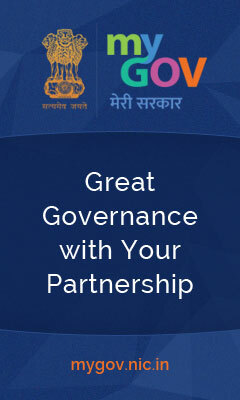 According to a press release issued by the Indian Embassy the UAE government has reviewed the information provided to it through the ‘Action Pan for Academic and Administrative Reforms’ issued by the University Grant Commission (UGC). The UAE education ministry has now come to know that the word ‘external’ in the mark sheets refer to the method of evaluation and not a place of study. The UAE Education Ministry has notified that it has no objection to equivalence those degrees that meet all the other certificate equivalency criteria. Scores of technology professionals across the globe dream of getting jobs in big companies like Google, Microsoft, Apple and Facebook among others right after passing out of their respective colleges. In India, thousands of students even prepare for years before they get into prestigious institutes like the Indian Institute of Technology. However, if you wanted to get through IIT and couldn’t, you have no reason to be depressed as it is not the end of your dreams and you may still be able to work for one of these. You don’t believe us? We’ll give you Abdullah Khan’s example. 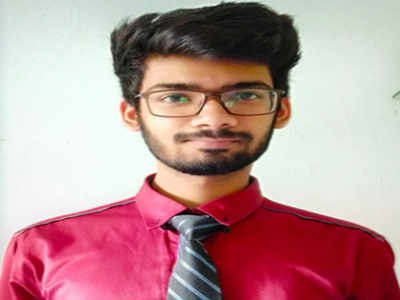 According to media reports, technology giant Google has hired the Mumbai based 21-year old engineering student after the company spotted him on a hosting website for online programming challenges. The search giant has reportedly offered him a package of Rs 1.2 crore. The reports also said that his six-figure package includes a base salary of Rs 54.4 lakh per annum coupled with a 15% bonus and stock options worth Rs 58.9 lakh over four years. 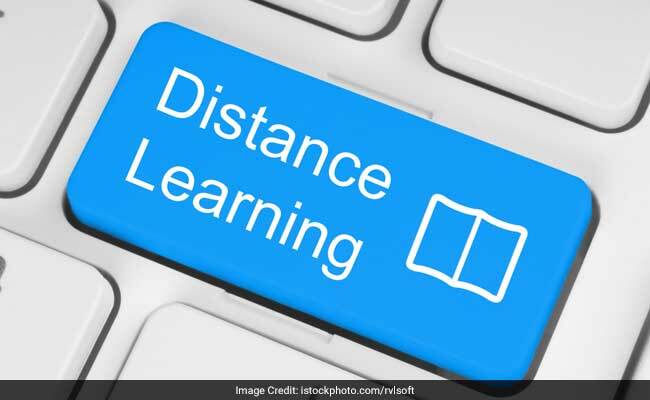 The University Grants Commission (UGC) has prohibited the universities from carrying a list of courses in distance mode. In the latest circular, the commission has asked higher education institutes (HEIs) not to grant degrees in ‘professional’ courses under distance or open learning mode. While the rule was in place earlier as well, in the recent 538th meeting of UGC, the number of courses under the ambit of ‘professional’ was extended. As per the new rules, agriculture and related courses will also be considered professional and institutes cannot deliver degree programmes in the field in open or distance mode anymore. Under the new rule, many institutes will have to shut their courses or tweak the degree programme. 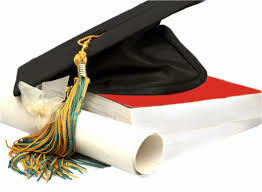 Among HEIs across the country, famous institutes that currently provide distance mode degrees in agriculture are Nasik-based Yashwant Rao Chavan Maharashtra Open University (YCMOU), Annamalai University, IGNOU, Kuvempu University and Nalanda Open University.